Las Vegas - Carlos Colina, lighting designer for the 2013 Latin Grammy Awards, staged at the Mandalay Bay Events Centre, Las Vegas, USA and produced by Univision, decided to make a point for Ricky Martin’s live appearance at the event… utilizing 18 of Robe’s new Pointe multi-purpose moving lights for the superstar’s acclaimed rendition of “Más y Más” together with singer songwriter Draco Rosa (who won Album of the Year). The show was broadcast live across the Univision network with a staggering 9.8 million viewers tuning in to all or part of the three hour telecast, which also generated record levels of interactive social media activity. 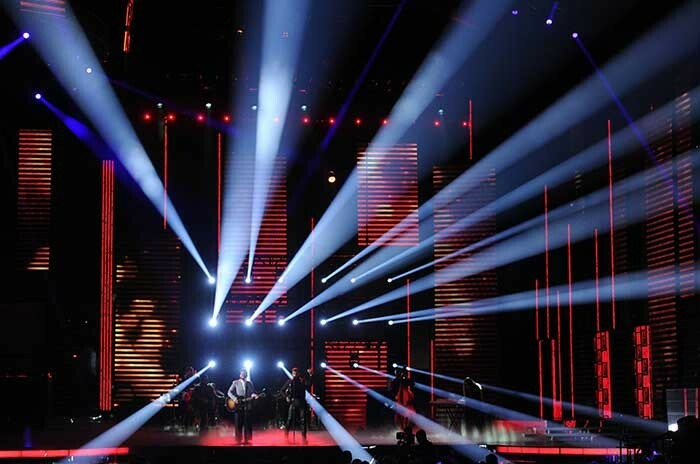 Colina has lit the Latin Grammys for the last seven years, and each year he and set designer Jorge Dominguez collaborate to produce a stunning visual concept for the action-packed line up, which included 21 live performances and the 13 Awards presentations. It was the first time that Colina had used Robe’s Pointe – which was only launched in April this year and is already a best seller! “They are bright, versatile, the prisms are amazing, the colours are excellent and they look simply fantastic on camera,” he comments. The fixtures came highly recommended by ‘Lighting Designer to the Stars’ Tom Kenny, who also lights many high profile Awards shows and has a host of legendary music stars on his resume including David Bowie, Eric Clapton and The Who. With Ricky Martin being arguably the highest profile Latin mega-star on the planet, Colina wanted his performance to have a high impact impression… and decided to create this using Robe’s Pointes. “The song was a very impactful ballad and a very special moment in the show,” says Colina, who had completed a render of the look he envisioned with the Pointes to get this signed off by the artist and his production team. “The result on stage looked exactly as it did on the render – and it was definitely one of the defining moments of the evening’s entertainment,” he declares. The Pointes were triple stacked in multiples of six on three 20 foot long upstage trusses, each of which were flown about five feet apart. These trusses were lowered in as Martin and his band took to the stage… and brought the house down. Colina’s lighting and visuals team for the show included lighting programmers Felix Peralta and Kevin Lawson, lighting director John Daniels (who called 15 followspots), lighting director on the floor Darren Langer, head gaffer Brett Puwalski and content programmer Laura Franks who ran all the playback video content. 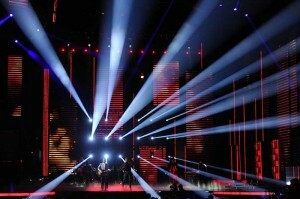 Colina is based in Virginia and lights all of Univision’s special events which amount to seven or eight major shows like this per year. 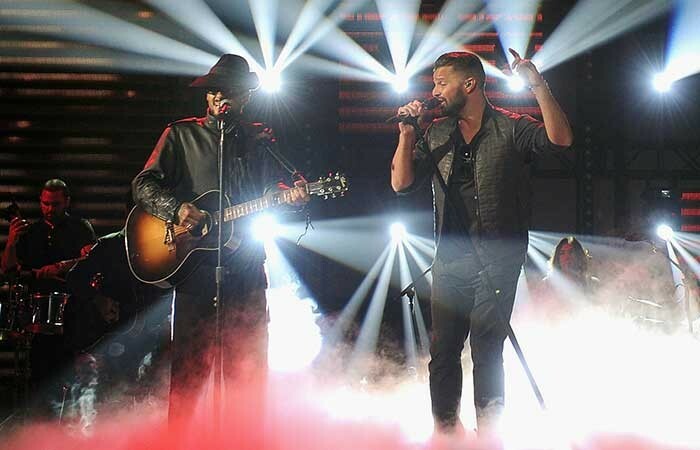 The lighting equipment for the Latin Grammys was supplied by Atomic Lighting of Pennsylvania, and Colina concludes that he will definitely be using Pointes in his future work… together with Robe’s LEDWash series fixtures of which he is already a fan.